Wasn’t I just talking about DC Universe Classics a few days ago? Okay, technically it was only in passing, since Catwoman was actually from one of the spin-off lines. The main line is particularly noteworthy due to just how deep into the DC Universe it went (something that may have contributed to its downfall in the end, unfortunately). One of my personal favorite subsets from the line was the Doom Patrol, who are one of my favorite DC teams. I’ve looked at Negative Man and Elasti-Girl, but now it’s time for me to take a look at the team’s final founding (and most consistently present) member, Cliff Steele, better known as Robotman! 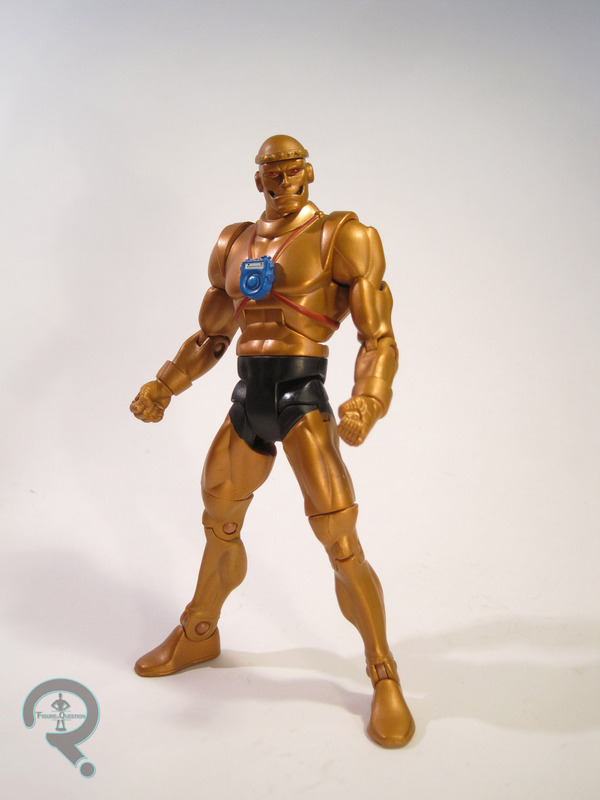 Robotman was released in Series 10 of DC Universe Classics, which was the second Walmart-exclusive series in the line. He was the first member of the Doom Patrol to be released, which was rather sensible, as he’s probably the most popular of the main three. The figure stands about 6 1/2 inches tall and he has 23 points of articulation. There are a few different Robotman looks to choose from, but Mattel went for his classic ‘60s design. It’s definitely a wise choice; it’s easily his best design, and it’s one he’s returned to a number of times over the years. Cliff is built on the medium male body, with his own unique head, hands, and upper torso. The new pieces all fit pretty seamlessly with the pre-existing stuff, and it all does a really great job of capturing Cliff’s retro-sci-fi design. The head is a pretty decent piece; it’s not quite as streamlined as Cliff frequently was in his classic appearances, but it’s a pretty close match. That slightly less streamlined appearance is also there due to the removable scalp, which allows us a view at Cliff’s brain. It’s a pretty fun little touch, which takes this figure from average to awesome. The upper those isn’t too far removed from the basic piece, but adds a few of Cliff’s extra robotic bits, as well as the video monitor that allowed the Chief to keep in contact with the team when they were on missions. Also, since the upper torso includes the ridges above each shoulder, some of the shoulder’s size is masked, thus remedying what I find to be the weakest aspect of the basic DCUC body. Cliff’s paintwork is some of the cleanest DCUC had to offer. In the comics, he was always just orange, but here he’s more of a copper sort of color, which looks really slick in person. The black shorts preserve his robot modesty (and also break up the colors a little bit), and there’s some really sharp detailing on the monitor. The straps for the monitor are a little rough around the edges, but not horribly so. 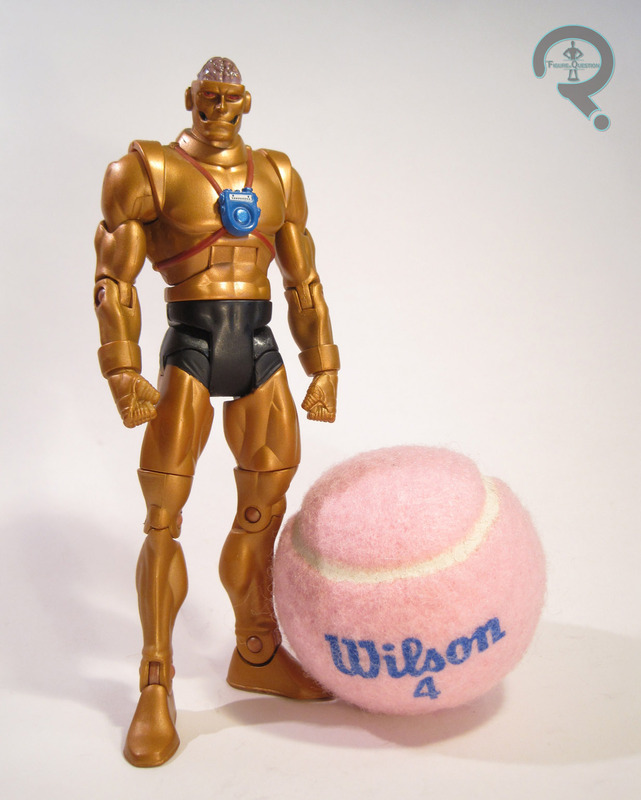 Robotman’s only extra was the torso of the series Collect-N-Connect figure Imperiex. It would have been kind of cool to maybe get an extra robotic Chief head from when he replaced Cliff on one of the missions, since poor Niles was never going to get his own figure. But, that’s honestly pretty issue-specific, and probably a bit much for a character that was already lucky just to be getting a figure at all. I found most of Series 10 at retail when it was released, but I never had any luck with Robotman. It was made worse by the fact that I really needed to find a pair of them, since my Dad’s a huge Doom Patrol fan too. Fortunately, my good friends at All Time Toys came through for me, and I was able to find two Cliff figures for a reasonable price. Robotman is a great example of the sort of awesome stuff this line could do when they actually put in the effort. He’s a lower tier character with exceptional execution, and just a really fun figure all around. As much as I rag on Mattel, this guy is really one of my favorites, and the whole Doom Patrol set is just really fantastic.